#ECSA2018: Gaining European Citizen Science Association inspiration! Having never been to Europe myself, it was intriguing to see just how large those alps are, and I was immediately struck by the politeness of the people, as well as the interesting mix of historical and modern cityscape aspects. Below are just a few reflections from my experiences attending the #ECSA2018 Conference and other pre- and post- workshops in Geneva, Switzerland, as well as a quick jaunt to England, in early June. 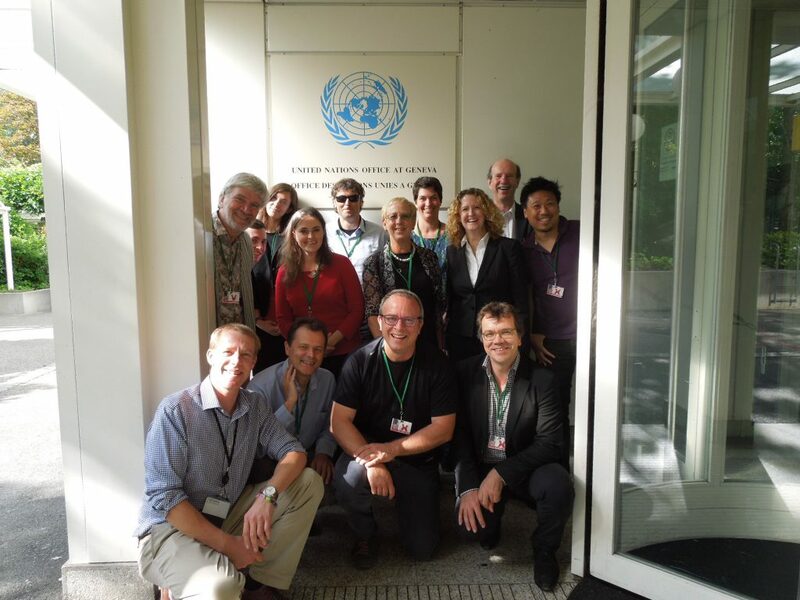 Attendees of the meeting to discuss the United Nations Sustainable Development Goals and citizen science at the UN Environment office in Geneva. 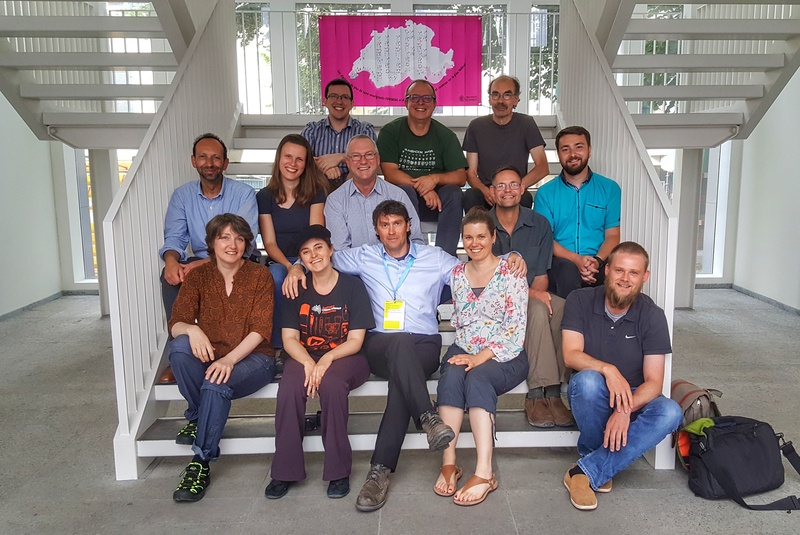 The day before #ECSA2018 officially started, people from some far flung corners of the world including Switzerland, Austria, Spain, Germany, England, China, the United States and Australia gathered at the UN Environment office in Geneva. 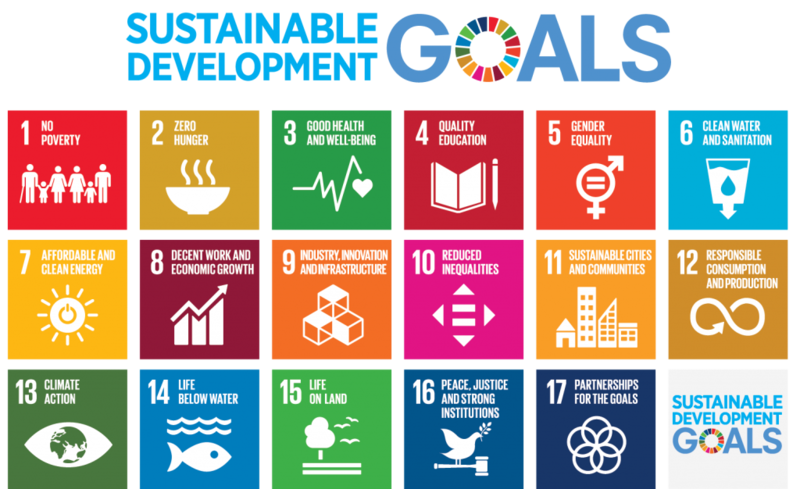 Martin Brocklehurst, Chair of ECSA’s Policy Working Group, asked us to explore what is needed to develop an institutional framework and gather support for scaling-up how citizen scientists can contribute to the UN Sustainable Development Goals (SDGs). Libby Hepburn then kicked off the workshop proper by sharing with us with an overview of how Australian governments and citizen science projects currently align with the SDGs, and how this could be expanded. Following this, Martin provided us with an analogous state-of-play for Europe and potential for the future. After these excellent overviews, Martin and Anne Bowser, from the U.S.-based Wilson Center, led multiple breakout sessions exploring framework needs and the role of the Citizen Science Global Partnership (CSGP) in advocating for and supporting citizen science and SDG alignment. The 17 United Nations Sustainable Development Goals. Anne Bowser then delved into what the Citizen Science Global Partnership may look like in the future through a number of events. She facilitated a conference dialog session, for example, exploring the 1) position and role, 2) community value, 3) personal value, and 4) networking potential of the CSGP in the context of the citizen science community and more broadly. The Citizen Science Global Partnership dialog session during #ECSA2018. Photo credit: Monica Peters. Community input from this session then formed the basis of a post conference workshop supported by the European initiative Citizen Science COST ACTION, further examining the goals of the Partnership, governance structure, and relationship to the business community. Outcomes will help to inform how the CSGP continues to take shape over the next two years. Attendees of the COST ACTION Citizen Science Global Partnership workshop. The work hasn’t stopped since Geneva! A number of people are continuing to push these global efforts forward into the future. Libby, Caren Cooper & Rosy Mondardini, for example, have initiated a SDG and Citizen Science Task and Finish Group as part of ECSA’s larger Policy Working Group. If you are interested in following progress or getting actively involved in exploring how citizen science can be a key contributing part of the SDGs you can register HERE. Martin and Anne are also very actively continuing their respective work gathering support and advocating for alignment of citizen science, the SDGs, and the CSGP. Martin is, for example, is encouraging citizen science advocates to represent these efforts at global events, including the UN World Data Forum & Eye-on-Earth Symposium in Dubai, United Arab Emirates. Funding is not currently available to support travel, but if you are interest or already attending and interested in SDGs, do let us know and we will put you in contact with initiative leaders. Who doesn’t love to talk about society, data, and metadata? Well, clearly a lot of citizen science folks in Geneva were game! As part of the conference, Jaume Piera, from the Institute of Marine Sciences, ran a dialog session on Simplifying citizen science methods for data. Our very own Peter Brenton, from the Atlas of Living Australia and CSIRO (AU), led a great workshop on Advancing citizen-science observational-data standards, where we explored a standardization of data for a number of participant case studies. Information gathered from this will feed into Australian and international efforts, such as the ACSA and CSA Data and Metadata Working Group, of which Peter and I are members. After the conference, Luigi Ceccaroni, from Earthwatch Europe and also a Director of ECSA, led a Citizen Science COST ACTION Working Group workshop to Improve data standardization and interoperability. During this workshop, Luigi progressed longstanding, ongoing discussions, and facilitated us collaboratively contributing to a document intended to provide “a recommendation on how to represent data and metadata in citizen science”. If you are interested in such things, be sure to check out this COST Action Working Group and Geneva Declaration on Citizen Science Data and Metadata Standards document! Attendees of the COST ACTION Data Standardization and Interoperability workshop. Photo credit: Luigi Ceccaroni. If you have an inquiry or want to get involved in any of these large-scale efforts around the SDGs, the CSGP, and Data & Metadata, just send us a message, and we will put you in contact with the respective project leader. This conference provided many opportunities to network and meet people in diverse ways. I thought it was a creative idea to give people water bottles of different colours and then have folks meet up based on the colours! The Public Citizen Science Festival was a hoot, where a few of us Oceania folks, including myself, Peter, and Monica Peters, got together and themed the letters we screen printed on our bags! 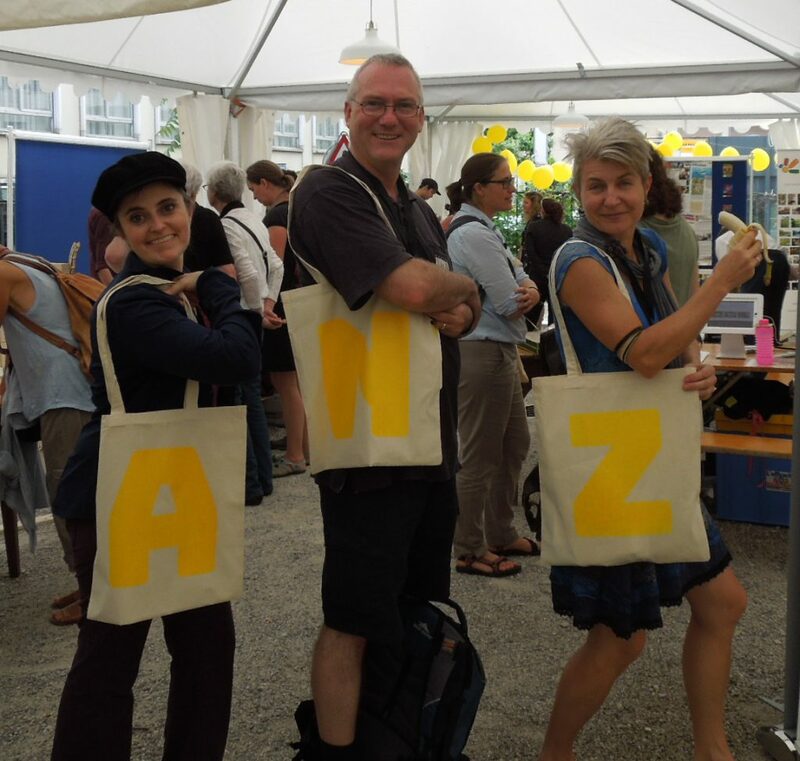 Folks who travelled from Australia (myself and Peter Brenton) and New Zealand (Monica Peters) having way to much fun with puns when deciding letters to screen print on our #ECSA2018 bags! While I didn’t think to snap any pictures that particular night, I had an absolute blast catching up with loads of people, including none other than the lovely Nina James, coming from University of South Australia to present her work Strangers, stewards and newcomers in CS. 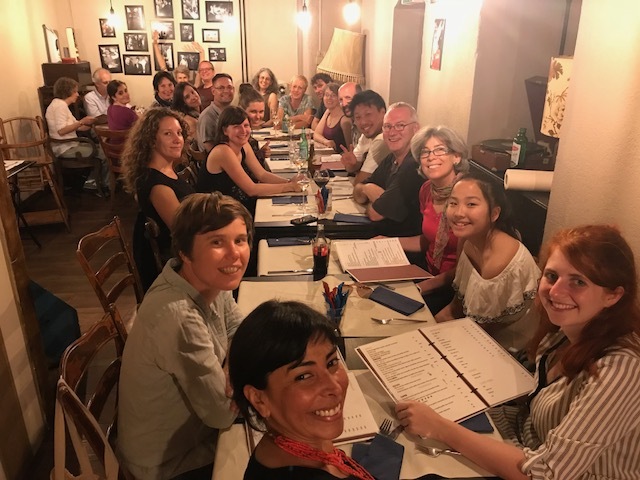 I felt fortunate to be able to attend another dinner that started out small and quickly grew to an awesome group of folks from all over the world thrilled by citizen science! Citizen science enthusiast from around the world gathering for a bite to eat in Geneva. Photo credit: Lea Shanley. The talks, workshops, sessions, posters, and meetings throughout the conference were absolutely top notch. I was particularly struck by the very thought provoking keynote address that Bruno Strasser from University of Geneva, Geneva, gave that certainly challenged my understanding of what citizen science is and how people participate in it. Shannon Dosemagen also gave a brilliant keynote sharing her journey that led to her working with communities to advocate for their environments through Public Labs. Then Sven Schade, from the European Commission, led a fascinating COST Action workshop exploring Citizen Science Strategies in Europe as well, where we heard from policy expert Paul Waller discuss opportunities and issues for citizen science as an input to policy development. 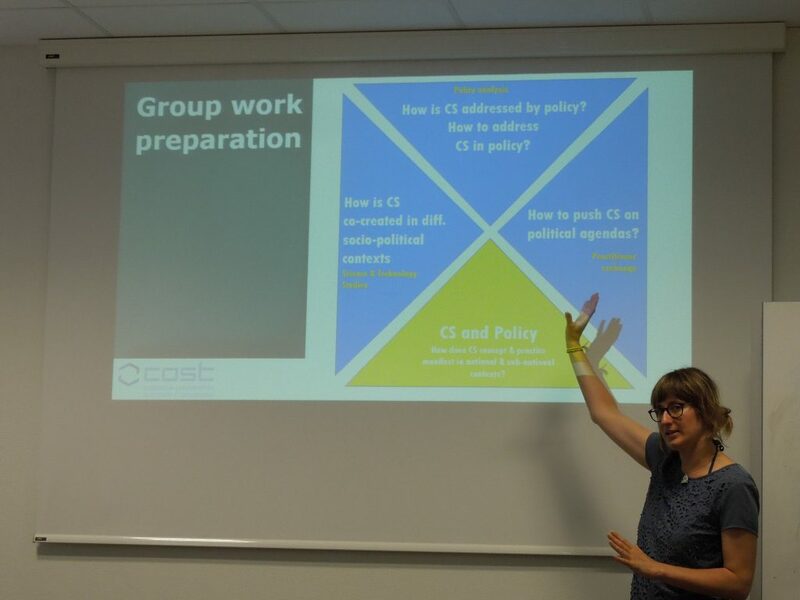 Claudia Göbel discussed how tasks of this working group are divided to explore different aspects of policy integration, what they have achieved to date, and what is envisioned for the future. Claudia presenting during the COST ACTION workshop exploring Citizen Science Strategies in Europe. It was also quite informative to attend the ECSA General Assembly, which is analogous to our ACSA Annual General Meetings. Here I learned not only about the structure of ECSA, but about their voting process, working groups and activities, outcomes of the year, and much more. The meeting didn’t start until evening and went into the wee hours of the night, but as you can see below, this crowd didn’t lack enthusiasm! As the conference wrapped up, I started to prepare for my continued #CitSci adventure. Just before I left Geneva, however, Jonathan Brier invited me to join him on a tour of European Organization for Nuclear Research, known as CERN, which admittedly I knew next to nothing about beyond some loose citizen science connections. Wow, my mind was completely blown learning about particle accelerators! 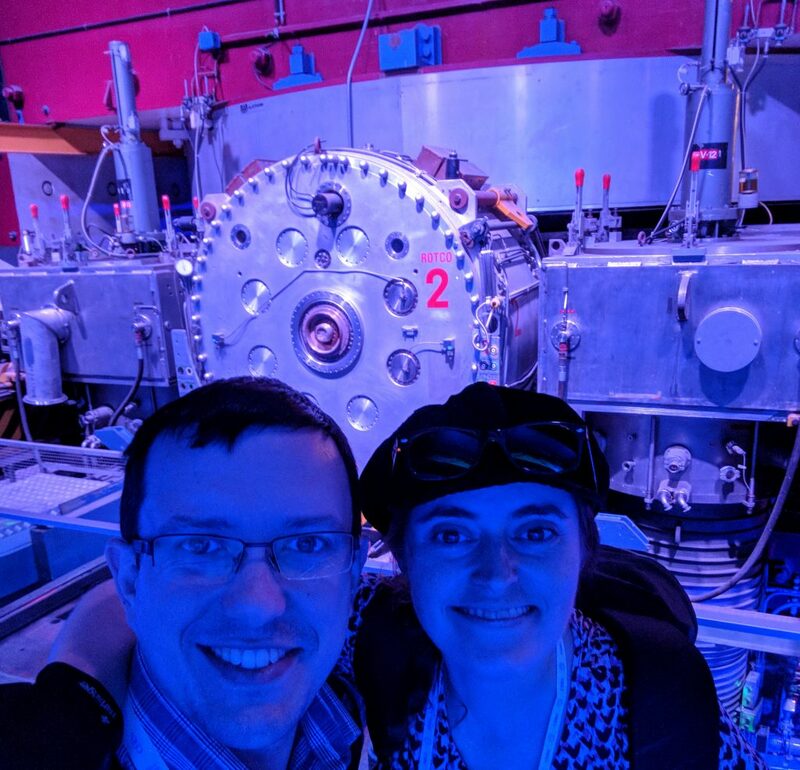 Learning the impressive and fascinating history of CERN and checking out decommissioned particle accelerator equipment with Jonathan. I then blasted off to London, where I did a whirlwind trip, learning more and exchanging ideas about ACSA and ECSA with folks including Margaret Gold and Lucy Robinson. 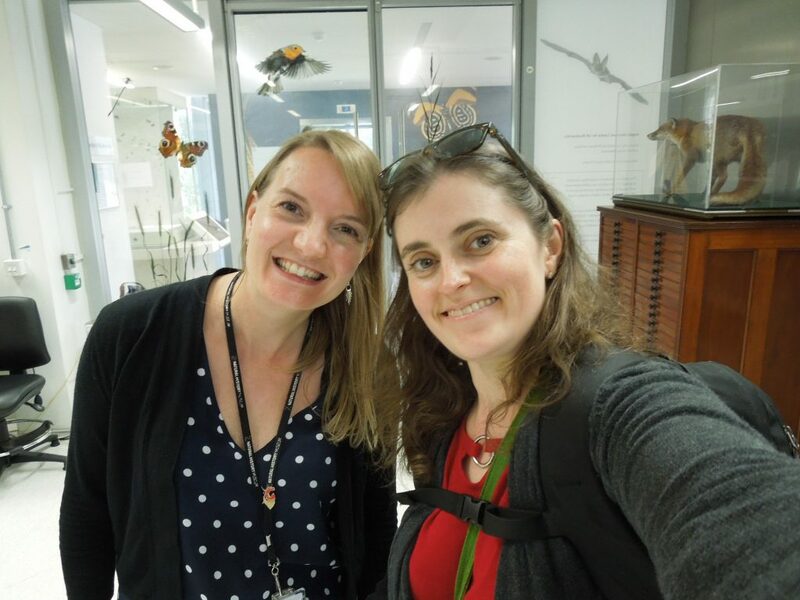 Catching up with Lucy at the Natural History Museum in London, before presenting and seeing some mind-blowing museum treasures. It was also a thrill to present my citizen science technology design research to Lucy Robinson, John Tweddle, and the other members of the Natural History Museum citizen science crew. One of my last citizen science stops was the University College London, where I presented my PhD work to the members of the UCL Interaction Centre, who are all doing really interesting technology design research. 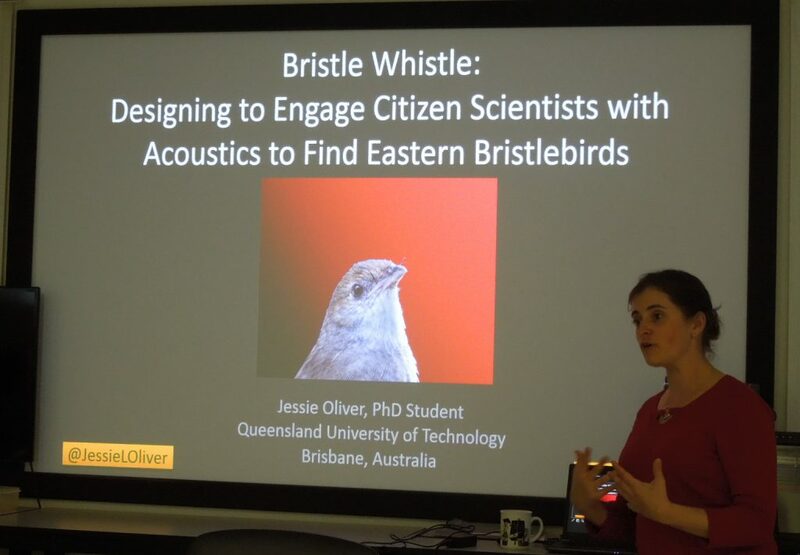 Excitedly presenting my PhD research on how to design engaging technology for citizen science and conservation. Then it was time to start my epic journey back to Brisbane! I can’t begin to express my gratitude enough for being able to attend so many wonderful events, and for all of the new and old friends alike that made this trip an absolutely worthwhile endeavour. It’s impossible to mention everyone who generously shared their time, knowledge, and passions for citizen science, but thank you to each and every one of you. Special thanks to Margaret for all of the support you provided on my London trip! I look to forward to sharing all that I have learned from this trip with members of our wonderful citizen science community here at home! Want more info about the conference? Check out the #ECSA2018 Conference website, the conference program. Conference attendees also often tweeted using the hashtag #ECSA2018, which you can search for via twitter. Michelle Neil, our own ACSA social media moderator, followed tweets from Brisbane, and created tweet summaries for each day of the conference as well, which you can also check out: Conference Opening | Day 2 Highlights | Day 3 Highlights | Final Day Highlights. 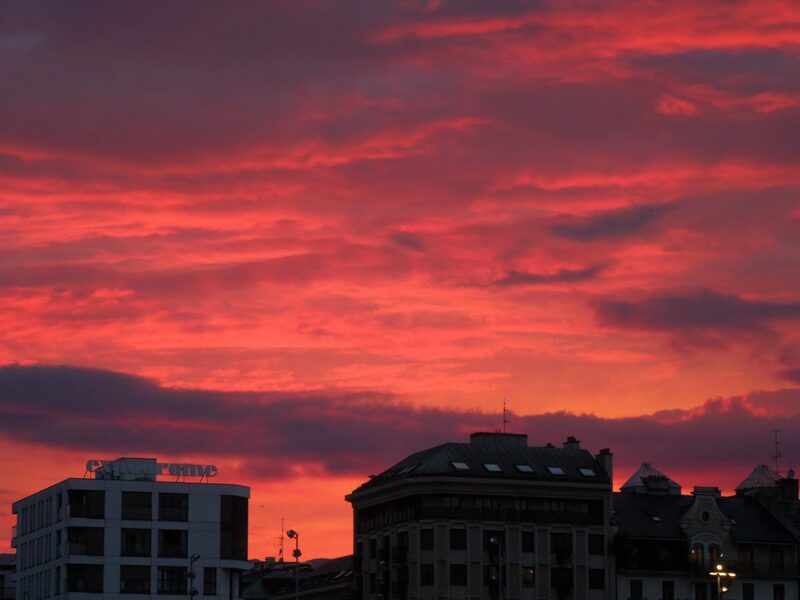 Geneva graced with me with one of the most amazing sunsets I have ever seen just as I was preparing to leave!